He survived a plane crash as a member of the Minneapolis Lakers team that nearly perished en masse in Iowa in 1960. Following a Sunday afternoon loss to St. Louis, they were to fly home on the team-owned 1930s-era prop plane, but an electrical outing put them in serious peril. It's a long and dramatic story, one that can be read here. The two co-pilots who managed to put the plane down safely in a cornfield in Iowa were later honored at a game in Minneapolis, and the Lakers players each kicked in $50 to give them $250 each for saving their lives. He kept running into Clyde Lovellete, so to speak. They grew up a year apart in Terre Haute, with Lovellete heading off to Kansas in '49 and Slick to Indiana in '50. Lovellette starred on a national championship team in '52, while Leonard helped lead IU to the national championship over Kansas in '53. They played against one another often in the NBA, and Leonard suffered a shoulder injury that led to the end of his playing career when he ran into one of Lovellete's screens. They worked together in running the Pacers' open tryout camp in June of '67, and remain close today. He wasn't afraid to fight. While coaching in the NBA, a Celtics player had roughed up his young star, Terry Dischinger. He recalls walking down to Boston's bench, grabbing coach Red Auerbach by his shirt collar and threatened violence if Auerbach didn't get the offending player out of the game. “I saw a little fear in his eyes, because he knew I was serious,” he told documentary producer Ted Green. He punched one of his own players while coaching the NBA Pacers, Mickey Johnson. Walking into the locker room after a homecourt loss, Johnson aggressively approached Slick to complain about his playing time. Slick instinctively responded with a punch that knocked down Johnson. His signature broadcasting call for Pacers' three-point shots, “Boom Baby!” originated during a playoff game in Denver in 1973. The Pacers led the series 2-1, but trailed Game 4 by two points in the final minute. During a timeout, Leonard drew up a play for George McGinnis to get the ball near the basket. In Leonard's recollection, McGinnis got the ball but was double-teamed, so he threw a cross-court pass to Keller. The newspaper account, however, reported that McGinnis was too well-guarded to get a pass, so Darnell Hillman delivered a pass to Keller on the left wing instead. Keller faked, dribbled to his left and fired a shot over 6-4 Claude Terry that gave the Pacers a 96-95 lead with 14 seconds remaining. As Keller's shot swished through the net, Leonard pumped his fist and shouted “Boom!” He then quickly added, “Baby!” Why? That was just Leonard's way of talking. He often added “baby” to comments when he was fired up. Such as in “Let's go, baby!” It just came out that way naturally. 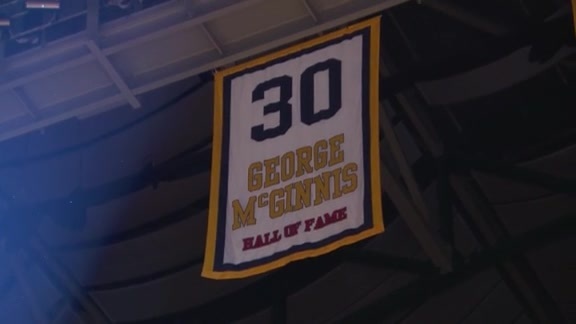 The Pacers went on to win the game, 97-95, and a legend was born. Nancy eventually copyrighted the phrase, but the Leonards have freely let anyone associated with the Pacers use it – such as Reggie Miller, who named his film production company “Boom Baby Productions. He hit the last shot ever taken at Market Square Arena. The very last event at MSA, following the final exhibition there in 1999, was a Pacers practice. Coach Larry Bird thought it would be appropriate if Leonard hit the final shot in the building, so he had Leonard come out to hit a layup after the workout was complete. Equipment manager/prankster Joe Qatato grabbed a ball and hit a shot after Leonard's, so Slick had to do it again. After PR director David Benner had shut off the lights that day, the final, final Pacers moment at MSA came when Reggie Miller planted a kiss on the center circle before heading home. His opinion still carries weight. When the Pacers were on the verge of elimination from their first-round playoff series with Atlanta this past season, trailing 3-2, he called coach Frank Vogel. Vogel called him back within five minutes, and Leonard offered his thoughts on the lineup he thought would be most effective against the Hawks. Perhaps Vogel was planning to go that route anyway, perhaps not, but he utilized the suggestions and the Pacers came back to win the final two games of the series. Bobby Leonard delivers his acceptance speech at the 2014 Naismith Memorial Basketball Hall of Fame ceremony. August 8, 2014 - Pacers.com's Mark Boyle chats with Frank Vogel about Bobby "Slick" Leonard's coaching career at the Hall of Fame Induction Ceremony. August 8, 2014 - Pacers.com's Mark Boyle talks with assistant coach Dan Burke about the lasting impact that Bobby "Slick" Leonard and wife Nancy had on the franchise. Look back at Bobby ''Slick'' Leonard's career as he is inducted into the Naismith Memorial Basketball Hall of Fame. Larry Bird talks about how proud he is of Bobby "Slick" Leonard being enshrined into the Basketball Hall of Fame. 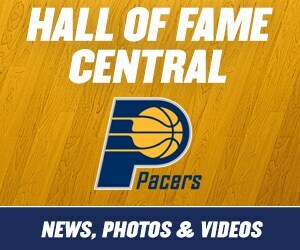 Mel Daniels on Slick in Hall of Fame: "It's About Time"
August 8, 2014 - Pacers.com's Mark Boyle gets reaction from Mel Daniels ahead of Bobby "Slick" Leonard's induction into the Hall of Fame. The Class of 2014 is introduced at the Hall of Fame news conference. Listen to the Class of 2014 as they speak at the Hall of Fame news conference. Slick: "It's an honor for our family." 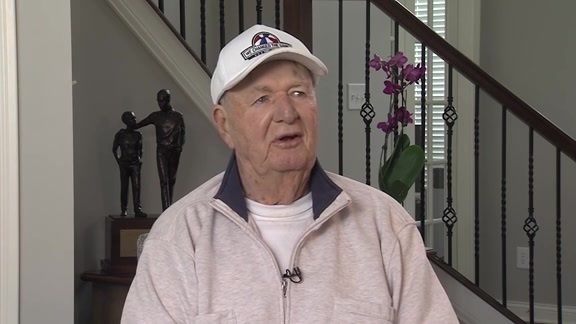 August 7, 2014 - Bobby "Slick" Leonard sits down with Mark Boyle in an extended interview at the 2014 Naismith Basketball Hall of Fame Enshrinement to talk about what it means to be inducted. Stern: "I'm honored to be here with him." August 7, 2014 - Former NBA Commissioner David Stern talks about Bobby "Slick" Leonard and what it means to be inducted in to the 2014 Naismith Basketball Hall of Fame alongside him. July 29, 2014 - Pacers.com's Eddie White speaks with VIP guests attending the world premiere of "Bobby 'Slick' Leonard: Heart of a Hoosier." Bobby "Slick" Leonard: "This is a Special Night"
July 29, 2014 - Pacers.com's Eddie White talks with Bobby "Slick" Leonard prior to the world premiere of the documentary chronicling his legendary playing, coaching and broadcasting career. Nancy Leonard: "It's Been a Great Journey"
July 29, 2014 - Nancy Leonard reflects on Slick Leonard's basketball career prior to the world premiere of the documentary "Bobby 'Slick' Leonard: Heart of a Hoosier." July 29, 2014 - Indianapolis filmmaker Ted Green talks about the excitement leading up to the world premiere of his latest film "Bobby 'Slick' Leonard: Heart of a Hoosier." July 29, 2014 - Pacers radio broadcaster Mark Boyle talks about working alongside Bobby "Slick" Leonard and shares a unique story from the 1994 Eastern Conference Finals. July 29, 2014 - Pacers.com writer Mark Montieth shares his favorite story and memories of Slick Leonard's basketball career. Slick Leonard: "A Hoosier Icon"
July 29, 2014 - President and CEO of WFYI, Lloyd Wright discusses his thoughts on 'Slick' before the world premiere of "Heart of a Hoosier." Ed Bonach: Slick Is a "Living Legend"
July 29, 2014 - CEO of CNO Financial Group, Inc., Ed Bonach, discusses Bobby "Slick" Leonard's legacy and thoughts prior to the world premiere of "Heart of a Hoosier." July 29, 2014 - Former pacers beat writer Robin Miller discusses Slick Leonard's coaching career election to the Hall of Fame. February 14, 2014 - Legendary Pacers head coach Bob "Slick" Leonard is named as a 2014 electee to the Naismith Basketball Hall of Fame. 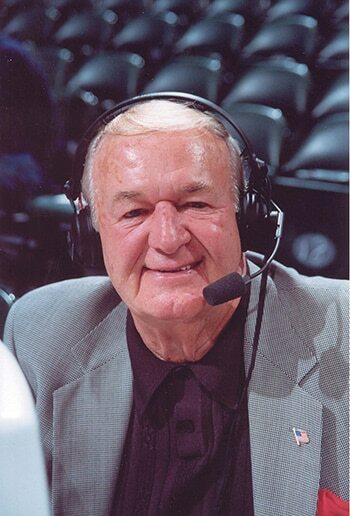 February 14, 2014 - The Voice of the Pacers, Mark Boyle, pays tribute to Pacers legend Bobby "Slick" Leonard on getting elected to the Naismith Basketball Hall of Fame. February 14, 2014 – Former Pacers player Darnell Hillman talks about what it was like to play for coach Bobby “Slick” Leonard and his impact on the history of basketball in Indiana. February 14, 2014 - Hall of Famer and USA Basketball director Jerry Colangelo reacts to Slick Leonard's election to the Naismith Basketball Hall of Fame. February 14, 2014 - Pacers head coach Frank Vogel reacts to Bob "Slick" Leonard's election to the Naismith Basketball Hall of Fame.